Chapter 8 generalizes the experience presented in Chapters 6 and 7. 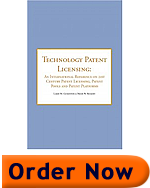 Ten specific rules are described for the creation any aggregated licensing program such as a patent pool or a patent platform. These rules describe specific actions to be taken from initial creation of the program up to the time of commercial launch. Taxation issues are explained. Advice is suggested for some of the main tasks. First a summary of the core problem addressed by the need to license patent rights. (c) the attainment of approval from the relevant antitrust authorities.